While there’s much debate on the origins of the cards – and many accusations from the church that they were ‘the devil’s picture-book’ – most evidence points to the cards’ early origins in Italy during the 1400s. The first tarots were not used for divination, nor for any occult practice, but were painted and printed to celebrate a royal family and a public holiday. The earliest surviving tarot cards were created for the family of the third Duke of Milan, Filippo Visconti. There are many early versions of this deck, kept in collections in Italy and NewYork; 239 surviving cards, in total. 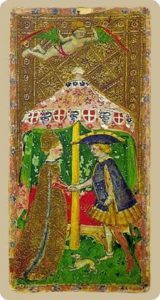 One version is believed to commemorate the the wedding of Bianca Maria Visconti, daughter of the Duke of Milan, to Francesco Sforza in 1441, joining together two of the most influential families in Northern Italy; The Lovers card depicts Francesca and Bianca Maria beneath a wedding bower. The Duke made this deck, and others he commissioned that we now refer to as Visconti or Visconti Sforza [link to deck in Market] not only unique but controversial: he painted other members of his family into the major arcana sequence. The Hanged Man Francesco Sforza’s father, Muzio Attendolo Sforza – a mercenary who changed his allegiance from Pope John, who had him caricatured as a traitor – the alternative name for the card. 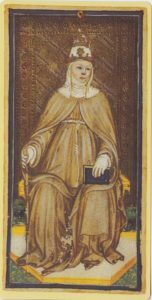 The High Priestess Sister Manfreda, a relative of the bride and an Umilata nun elected as a female Pope by the Guglielmite sect and burned for heresy in 1300. Is there evidence for any earlier major arcana? 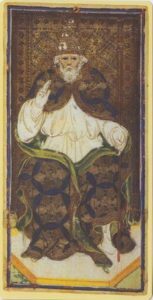 While it’s likely the earlier playing cards, from which the minor arcana evolves, came from China, there’s another contender for the majors: the Grigonneur deck, or Charles VI, supposedly of 1392. Griggoneur was a Parisian painter who, according to an early record, was paid to paint three packs of cards, ‘ornamented with many devices’, for the French king. However, it’s now believed these cards are mid-fifteenth century and Venetian. One clue lies in the Page of Swords, whose armour appears more fifteenth than fourteenth century in design. Seventeen cards from this deck are held at the Bilbiotheque Nationale in Paris.